Last week, I took my very first Alaskan cruise. While I generally don’t like playing the role of “tourist”, taking a cruise up to Alaska is actually a pretty cost-effective way to see the area. While seeing receding glaciers calving was both awe inspiring and depressing, as I saw first-hand the effects of climate change, I want to talk about parking in Alaska. Juneau is the capital of Alaska and has a population of around 30,000. The community has an old downtown core as well as a typical “Langley Bypass”-type area complete with Wal-Mart, Home Depot, and all the regular chains. In some regards Juneau reminded me a bit of Langley. Entering Parking Management Zone Sign in Juneau, Alaska. In order to help manage parking demand in a politically sensitive manner, Juneau installed parking payment/registration stations in their walkable downtown core. In downtown, anyone who parks a vehicle must register at one of the parking stations. Once registered, a vehicle will get two-free hours of parking per day after which it will cost $2 per hour. The genius of the parking plan is three-fold. First, it prevents long-term parkers from playing musical-chairs with their vehicles as the two-hour parking limit does not reset if a vehicle is moved to another space. Second, it warms people up to the idea of paying for on-street parking to manage the demand. Finally, it allows people to pay a price for on-street parking if they wish to park longer than two hours in the downtown core. 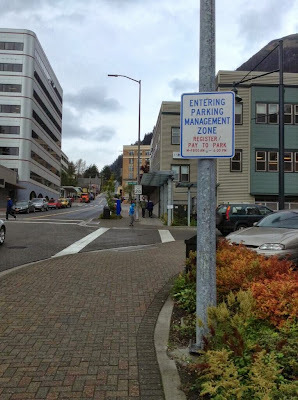 As most buildings don’t have on-site parking in Downtown Juneau, there is also two city run off-street parking facilities. To encourage the use of these facilities, short-term parking is pricing at $0.50 to $0.75 per hour within them. For long-term parking, weekly, monthly, and yearly parking passes are available. A monthly parking pass in Downtown Juneau is currently $50 per month. If Juneau was able to introduce a parking management strategy that included paid on-street parking, certainly a similar plan could be introduced in Downtown Langley and Fort Langley. One of the reasons why there is an apparent parking problem in Downtown Langley and Fort Langley is that many people who work in the area end up parking in the limited on-street spots. Introducing a parking policy like in Juneau would be a good first step to managing parking in both these areas. Beside managing on-street parking, as I’ve posted about in the past, a central parkade is also important as it provides a place for long-term parking without needing minimum on-site parking requirements that would turn a walkable core into “Langley Bypass”-type areas. It has been about three weeks since Leap Ahead, a transit plan for Metro Vancouver has been released. One of the objectives Paul Hillsdon and I set for the plan was to start a productive conversation about transit funding in the region again. By all accounts, I think we have succeeded. Leap Ahead got a good amount of coverage in the mainstream media. We also sent the plan to all local governments in the region. Local governments have reached out, and we’ve had some good chats with local mayors, planners, and even TransLink about Leap Ahead, transit funding, and the potential transit funding referendum next year. One of the questions that many people have been asking is now that the plan has been released, what is the next step. Well, I’m happy to report that other groups are gearing up to fight for transit expansion in the region, and have embraced the framework presented in Leap Ahead. One such organization that I’m helping out is GetOnBoard BC. I highly suggest you check out their website and consider volunteering some of your time with them. Another organization that has written about Leap Ahead is Moving in a Livable Region. Generally, I’ve heard positive feedback about using a small 0.5% increase in PST in Metro Vancouver to pay for transit expansion. In fact, the people I’ve talked to that don’t support an increase in PST to pay for transit don’t believe transit is important, or hate sale taxes in general. I don’t think any facts or figures will convince these people to think differently. Of course, there is a broad spectrum of people that might be sitting on the fence, and giving them more information will help. Moving in a Livable Region wrote a great post on their website about using a 0.5% increase in PST to fund transit. I suggest that you check out the full post, but I wanted to share two important sections. Sales Tax Comparison: Vancouver, Toronto, Montreal. Click graph to enlarge. 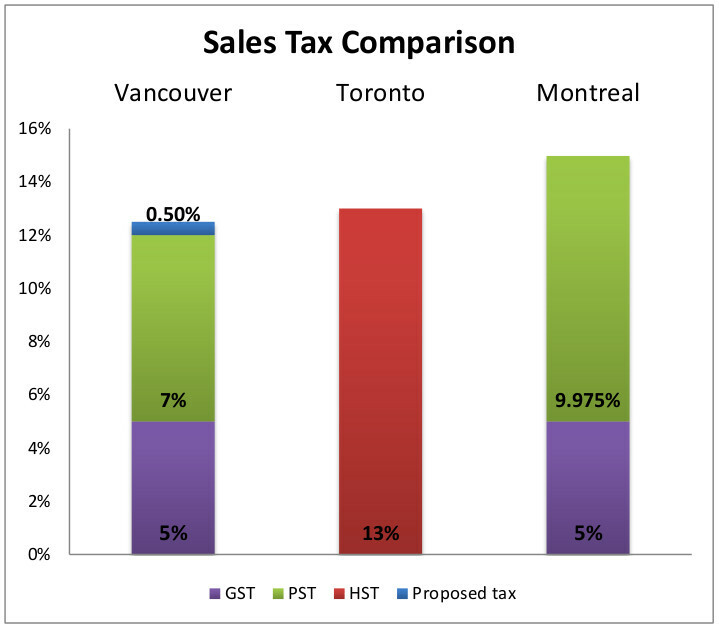 The graph show that even with an increase in PST, Metro Vancouver will still have a lower sales tax than the two other major centres in Canada: Toronto and Montreal. Two obstacles to the regional sales tax include the Metro Vancouver business community and low-income households. Businesses would have to weigh the gains of reduced travel times and higher customer visit rates against a slight tax disadvantage (compared to neighbouring regions). For low-income households the sales tax would be slightly regressive due to the fact that retail expenditure takes up a larger chunk of this group’s budget. However, since public transit funding disproportionately benefits lower income households, the retail sales tax hit might be negated. The concept of a new sales tax is pragmatic, straightforward, and tested in other regions. Contrary to the failed HST platform with its seemingly intangible benefits, the 0.5% “tax for transit” proposal puts five hard projects on the table. One of the other comments I heard from people is that there should be higher transit fares to pay for expansion. This is a fair request, but as pointed out by Moving in a Livable Region this is “something Translink has tried to do, only to be denied by its independent regulator” which was setup by the province. With a potential referendum on transit funding only a year away, I will be working with organizations like GetOnBoard BC to help win the referendum so we can expand transit in our region. David Gordon, a Queen’s University researcher and urban planner, has been researching Canadian metropolitan areas for several years. He recently released a report which shows that over 2/3rds of Canadians live in some form of suburban neighbourhood. Gordon doesn’t define suburbs as areas far away from the central city. For example, the City of Vancouver has auto-oriented suburbs in his research. Gordon defines two types of suburban areas: transit-supporting and auto-oriented. Gordon developed a method to determine whether an area was an active core where walking and cycling rates are higher than average in a region, a transit supporting suburb where transit usage is higher than average in a region, or an auto-oriented suburb. He piloted his theory in the Ottawa region in 2011. He has now expanded his research and investigated 33 Canadian metropolitan areas. Classification of neighbourhoods in Metro Vancouver as Active Core, Transit Suburban, or Auto Suburban. Click image to enlarge. The classification of areas as active, auto-oriented suburban, or transit-friendly suburban is based on 2006 Census information. Population information is based on 2011 Census information. In Metro Vancouver, there has been changes to our urban form since 2006. 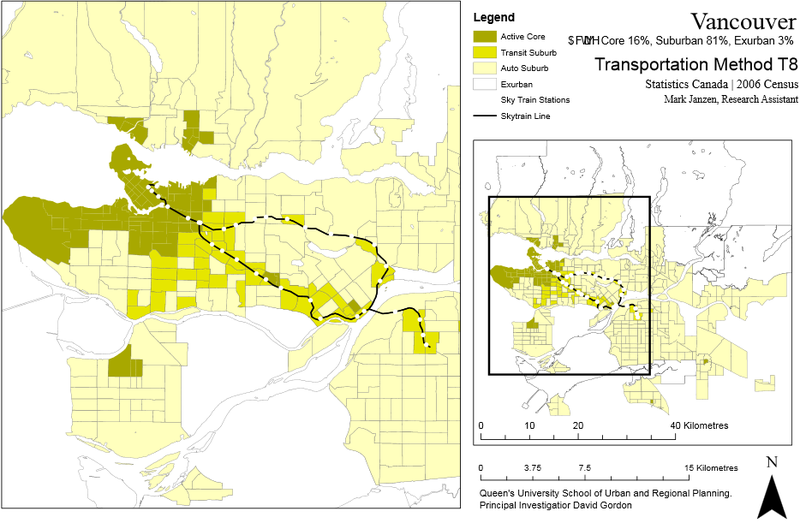 For example, the research doesn’t take into account the impact of the Canada Line. In our region, the City of Vancouver seems to get all the attention when it comes to livability and sustainability. Many people that are passionate about sustainable communities seem to spend most of their energy focusing on the City of Vancouver, but ignore the rest of the region. With Gordon's research in mind, and the fact that the highest growth areas in Metro Vancouver are in places like Surrey and Langley, more energy should be spent outside of the City of Vancouver. Transportation and land-use planning go hand-in-hand. While South of Fraser communities can do a better job of creating walkable nodes, without transit to connect them, most people will still need to drive a vehicle. The key is to provide frequent transit service to these node and connect them together. The major limiting factor in Metro Vancouver to increase sustainability and livability is that there is no funding to increase transit service in the region. Without increasing transit service, our suburban areas are likely going to remain auto-oriented. Earlier this year, I read the book “The High Cost of Free Parking” by Donald Shoup which provides a critique on parking policy in Canadian and American cities. Shoup notes that much of the built-form we see in our communities is a result of overly generous parking requirements. He also notes that because parking is free when most people are parking a vehicle (Shoup actually show how the cost of parking is bundled into almost every transaction we make), the marketplace becomes distorted and we end up with empty parking lots and over-subscribed on-street parking. One of Shoup’s solutions is to introduce performance-based on-street paid parking, so that minimum parking requirements can be relaxed or eliminated. You can read more about how Shoup's ideas could be applied in the Langley City in a post I wrote in June. Anyway, the Seattle-based Sightline Institute has a blog series called “Parking? Lots!” which exams parking polices. One of the posts contains an animations on how minimum parking requirements are determined in the US and Canada. Driving in Circles from Don Baker on Vimeo. Motion graphic showing the misleading the process that results in city requirements for more and more off-street parking. Earlier this year, I wrote about how some waste haulers that collect commercial, multi-family, and institutional garbage from Metro Vancouver are dumping it in Abbotsford to bypass the strict waste management requirements in our region which are meant to keep recyclable materials, materials part of BC’s Product Stewardship program, kitchen waste, and construction waste from going to landfill in Cache Creek or being incinerated in Burnaby. Metro Vancouver is looking at a bylaw that would make it more difficult for waste haulers to dump our garbage in Abbotsford, bypassing regional waste management policies. Metro Vancouver was originally going to require waste haulers get a license to ensure accountability that waste was managed within our region. This was met with fierce opposition from private waste haulers who accused Metro of limiting the “free market”. Metro Vancouver has backed away from the idea of requiring a license for waste haulers. The new bylaw would “require” that garbage ends up in regional facilities. A hauler could face a fine of up to $200,000 each time garbage goes outside the region. I guess Metro is planning on having trash spies to catch haulers that ship trash outside of the region. On September 5th, Metro Vancouver’s Zero Waste Committee was given the opportunity to provide third reading to the bylaw. The bylaw would require the approval of the provincial government before it could be enforced. In other controversial waste management news, Metro Vancouver is continuing the processes of finding a site for a future waste-to-energy (incineration) facility. Metro has put out a request for proposal (RFP) for anyone who has land available in the region that would meet the requirements for the siting of a waste-to-energy facility. The RFP closes in October. Once Metro comes up with short list of locations, I’m sure there will be renewed discussion about waste-to-energy in the region. Yesterday, I noted that most people don’t like high-speed traffic rushing through their neighbourhoods. With this in mind, it is no surprise that in the Township of Langley there is a steady request for traffic calming to be implemented in neighbourhoods throughout the community. Traffic calming is meant to slow down traffic which reduces the risk of fatalities from pedestrian/cyclist and motorist collisions. Traffic calming measures general reduce speed and can be used to reduce traffic flow by making the route less desirable for thru-traffic. As of today, there are 76 locations in the Township of Langley were people has requested traffic calming. Because of the large amount of requests and the fact that the Township only dedicates $100,000 per year for traffic calming, about two site can be traffic-calmed per year. The Township has adopted a policy to prioritize locations that receive funding. Most prioritized traffic calming locations are around schools and parks. If a located make it to the top two positions on the list, it must also get 2/3 majority approval by ballot of all people that live within 1.5km of the proposed traffic calming site. Such a high level of approval almost makes it impossible to get traffic calming implemented. The top two sites for 2013 where 256 Street fronting Coghlan Fundamental Elementary School, and 212 Street fronting James Kennedy Elementary School. While the majority of people in both locations wanted traffic calming installing, it did not meeting the Township’s onerous 2/3 majority requirement. The Township will now be moving down the list to the next two prioritized traffic calming sites. In the meantime, students that walk to Coghlan Fundamental Elementary School and James Kennedy Elementary School will be exposed to higher speed traffic which is not a good thing. The fact that people request traffic calming is a symptom of a greater problem with our transportation system. Traffic engineers have been focus for too long on building a transportation network that moves cars quickly from one area to another, instead of focusing on building a transportation system and community that connects people with the places they want to go (whether it be by walking, cycling, transit, or driving.) This focus on auto-oriented design causes all sorts of problems that impact human physical and metal health, the environment, the public realms, and even economic activity. If our transportation network was more accessible, traffic calming would naturally occur. In fact even today, I’m surprised that sidewalk extensions that make crosswalk more visible, and roundabouts which reduce fatal collisions are considered traffic calming and not best-practice design. The Township of Langley is becoming better a building complete streets that support all travel modes and is starting to design more accessible neighbourhoods in Willoughby. These new area should be traffic-calmed by default. Today, the vast majority of the Township’s transportation network is designed to move cars quickly. With a large list of traffic calming requests and the importance of making streets safer for all users, the Township should consider lowering the 2/3 majority approval required to implement traffic calming. The Township should also consider increasing funding to traffic calming, and as money is always an issue, spread out some road expansion project to free up funding. In June, TransLink along with New Westminster and Surrey pushed the reset button and relaunched the public consultation process for the potential replacement of the Pattullo Bridge. As I posted about in June, the original plan was for a 6-lane replacement bridge to feed into the now cancelled North Fraser Perimeter Road. Without the North Fraser Perimeter Road and with the objection from New Westminster about building a bridge with so many lanes that would funnel traffic through the heart of that community, the assumptions about the bridge had to be reevaluated. Close to 4,000 people participated in the consultation process. Traditional consultation as well as regional polling was conducted to get a more complete picture of people’s views about the potential bridge replacement. Not surprising, the major of people in Metro Vancouver and in the consultation agreed that something should be done about the Pattullo Bridge. Also, the majority of people in Metro Vancouver and in the consultation agreed that we should be shifting travel mode to walking, cycling, and transit, minimize single-occupancy vehicle usage, and general work towards building a livable region. Things got a bit interesting when it came to bridge replacement options. People’s opinions were split on what should be done about the Pattullo Bridge. Consultation participants and New Westminster residents generally supported building a new 4-lane Surrey-Coquitlam bridge with a 2- or 3-lane rehabilitated Pattullo Bridge. North Surrey and the rest of Metro Vancouver had more support for building a new 6-lane bridge at the existing location. There was also some support to replace the Pattullo with a new 4-lane bridge at the same site. One interesting observation is that generally people don’t want traffic following through their neighbourhoods, but are happy to dump traffic into someone else’s neighbourhoods. If the new 4-lane Surrey-Coquitlam bridge ever moves forward, combined with the new Port Mann Bridge, there will be 8-lane of traffic just for Surrey-Coquitlam traffic. I have to wonder if that supports the goals of reducing single-occupancy vehicle usage and encourages the creation of a livable region. The potential replacement Pattullo Bridge, South Fraser Perimeter Road, and other proposed new road infrastructure in the region is primarily meant to support goods movement and Port Metro Vancouver. With this in mind, it was interesting to see that the need to limit or ban commercial/truck traffic from Pattullo Bridge was one of the top three recurring themes from consultation participant when asked for additional feedback. In the feedback received, people believed that truck traffic is what cases congestion. In reality, everyone who drives on the road (and the majority are in single-occupancy vehicles) causes congestion. To my point about people not wanted traffic in their neighbourhoods, the top concern from the additional feedback received was about increased traffic in neighbourhoods and vehicles ‘rat-running’ through residential areas. Other themes from the additional feedback was support for equitable tolling throughout the region which is likely why one of the other themes was a desired to see no tolling on the Pattullo Bridge replacement. Looking at the results of the consultation, TransLink, Surrey, and New Westminster have their work cut-out for them as there is a diversity of opinions about replacement options. Of course the big question will be how the new bridge(s) will be funded. For more detail information, I suggest you read the full consultation summary report. 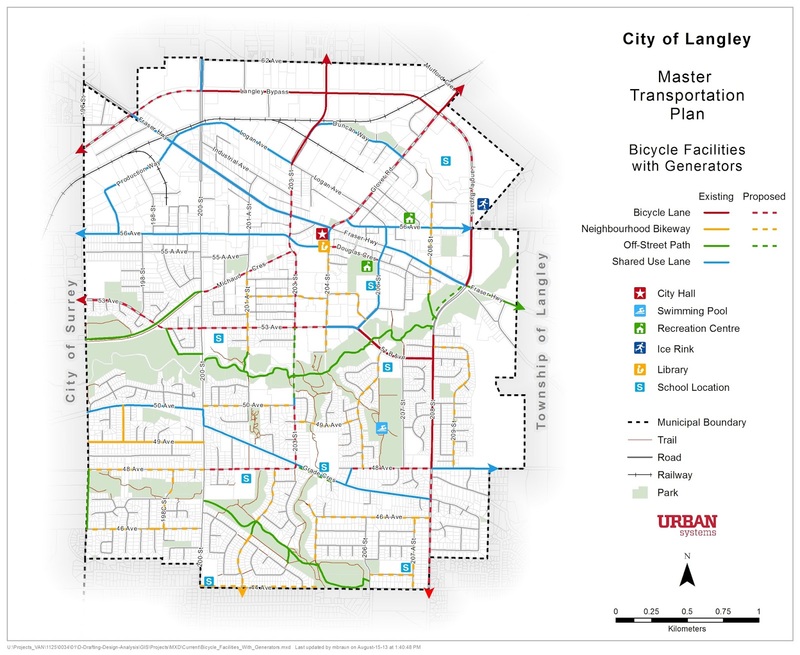 Last Thursday the City of Langley Parks and Environment Advisory Committee, which I am appointed to, got a sneak peak of proposed changes to the cycling and pedestrian network as part of the Master Transportation Plan update which the City is currently working on. One of the interesting things that the people who are working on the Master Transportation Plan update recognize is that the City needs a full north/south and east/west cycling corridor as they noted that 60% of people would cycle if there was off-street or protected cycling facilities. Shoulder bike lanes really only serve 10% of the population that are considered hard-core cyclists. In 2010, the Parks and Environment Advisory Committee passed a motion to have the City investigate installing segregated/protected bicycle facilities. I’ve been advocating for segregated/protected bicycle facilities for many years including on 53rd Avenue and 203rd Street. 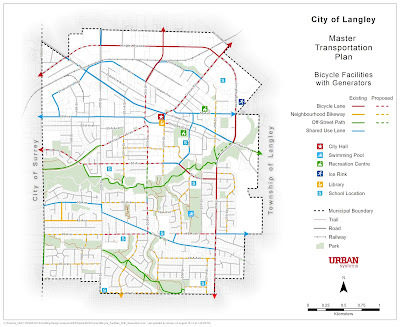 Draft Concept Bike Network - City of Langley Master Transportation Plan. Click map to enlarge. The good news about this plan is that it now incorporates the off-street trail network into the cycling network, and even proposes some expansion to the off-street network. The proposed off-street network would serve as the main east/west corridor. The plans also suggests adding on-street bike lanes to 203rd Street to serve as the main north/south corridor. The thing that concerns me is that this draft plan does not appear to be advocating for protected cycling facility on 203rd Street. 203rd Street is wide enough to accommodate protected cycling lanes will minimal effort, and as the writers of this update noted, protected cycling facilities are critical. I can only hope this gets changed before the updated plan gets adopted. Another observation is that both Surrey and the Township of Langley have installed on-street bike lanes along Fraser Highway. The City of Langley is not, so there appears to be a break in this regional cycling route. This is something that needs to be resolved. 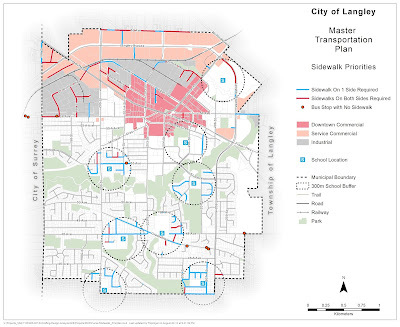 Draft Concept Pedestrian Network - City of Langley Master Transportation Plan. Click map to enlarge. The updated plan also looks at filling in the sidewalk network, especially around school. This makes a lot of sense. One of the concerns I have is that many sidewalks north of the Nicomekl River and in the downtown core are actually too narrow when you consider the volume of people that use mobility aides in the area. I’m waiting to hear back if the plan will suggest sidewalk widening in those areas. The maps in this post are draft and could be subject to change before the plan goes to a public open house for further comments shortly. With the potential referendum on transit expansion funding about a year away, many people and organizations are starting to get information out about the benefits of transit and a multi-modal transportation system. SFU is hosting two events on transportation and transit in the coming months that I believe are worth attending. With the clock ticking, and few public details about the 2014 transportation referendum, this is an opportunity to enter into a dialogue about what has worked, and what hasn't in past referendum votes and ballot initiatives. Join us to hear from three seasoned campaigners about effective strategies and lessons learned. One of the panellist at this event will be Denny Zane who created Move LA in 2007 to bring together business, NGOs, labour, and environmental leaders to help lead the campaign for the Measure R sales tax which is a voter-approved sales tax in Los Angles that is funding transit expansion. Metro Vancouver is a region that relies on many modes of transportation to keep its economy, and its people moving; from trucks to trains to cars to bicycles. Being able to move around our cities is critical for transporting goods, accommodating jobs and population growth, building strong and vibrant communities, and connecting with our partners in the region and elsewhere. But how do we pay for our transportation system in a way that is fair and transparent and provides for our current and future needs? SFU will be holding the event in Surrey on October 22 and in Langley on October 29. Registration information can be found on that event’s webpage. As I posted about in July, things are starting to heat up between the Township of Langley and Metro Vancouver. 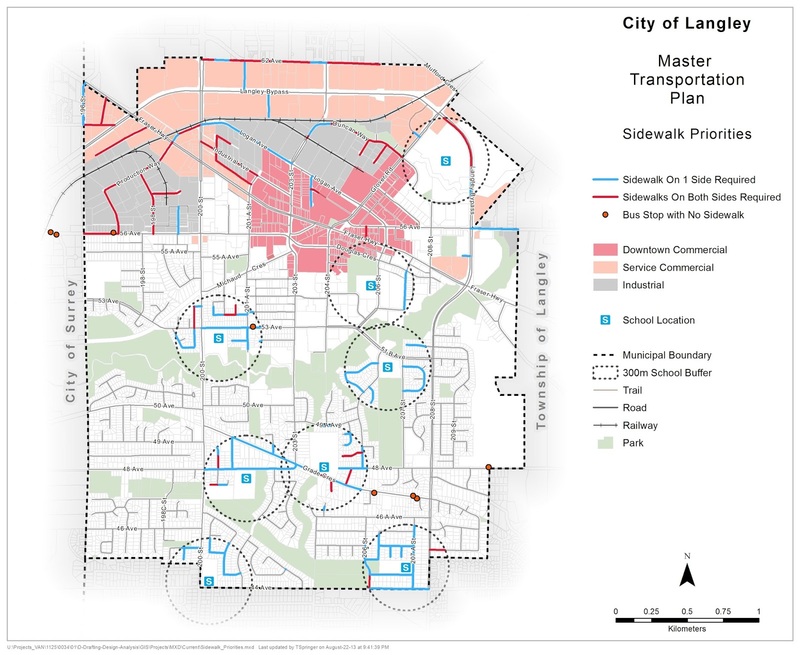 Metro Vancouver is suing the Township of Langley to prevent the Township from implementing the full University District plan. When news of the legal action broke last year, some Township Councillors mused about leaving Metro Vancouver and joining the Fraser Valley Regional District. As Metro Vancouver’s action against the Township winds its way through court, I’m sure there will be renewed chatter about leaving the region. Metro Vancouver provides many important services to the Township of Langley with two of the major services being water and sewer. Metro Vancouver provides a good value for the services it provides. For example, water rates in the South of Fraser can be around 50% less expensive than places like Abbotsford. Some of the savvy councillors know this. Like the Quebec Separatist who wants to leave Canada, but keep all the services the country provides, some Township Councillors want to be removed from Metro Vancouver’s regional planning regulations, but keep all the service the region provides. This make sense as the Township has spent or plans to spend close to $50 million connecting eastern Langley (including Aldergrove) to Metro Vancouver’s water and sewer network. Western Langley is already connected to Metro Vancouver. While I think it is highly unlikely that the Township of Langley will leave Metro Vancouver, if for some reason it was allowed to join the Fraser Valley Regional District, the prices of water and sewer service would go up at least 20%. I wouldn’t want to explain that to citizens if I was a councillor. When UBC (ironically as it has the School of Community and Regional Planning) had issues with regional planning as it applied to its Point Grey campus, it complained to the province. The province removed the Point Grey campus from the regional district. As a result, UBC pays a 30% markup for water and the University Endowment Lands pays a 20% markup. In June, the Metro Vancouver Utility Committee heard a request to lower the markup for non-Metro Vancouver members like the UEL. This request was denied. While some people might have issues with regional planning in Metro Vancouver, being a part of the biggest (population and resources) regional district comes with many benefits including as lower property tax bill for utilities. If Main Street, U.S.A. and a power centre had a baby, they would produce an urban lifestyle centre. Urban lifestyle centres are the latest trend in shopping mall design that tries to recreate a town centre complete with main street. Urban lifestyle centres are a response to the increasing demand of consumer who are rediscovering the pleasure of shopping in downtowns and along main streets, and urban living in general. Highstreet in Abbotsford is an urban lifestyle centre that I wrote a post about when it was first proposed in 2010. Now that Highstreet is partially open, I decided to stop by the mall, look around, and take some pictures. Now for an auto-oriented shopping centre, Highstreet gets some things right. Because most of the parking is enclosed and the majority of the mall is built on top of the parking, Highstreet uses around 50% less land than a traditional power centre. This means that the site is less sprawled. The developers of Highstreet, Shape Properties, are also working toward LEED certification which is good news. Other than that though, Highstreet is no better at creating an accessible or sustainable community than any other auto-oriented shopping mall. Even though Highstreet has a faux-main street complete with a “public square” and playground, it is missing one of the key ingredients of a real accessible town centre, housing options. In fact, as the pictures show, Highstreet completely turns its back towards the street and Abbotsford. This makes sense as Abbotsford decided that 600,000 square feet of retail should be surrounded by nothing more than single-family housing. While the Highstreet website using words like pedestrian-friendly, it is only pedestrian-friendly if you happen to drive to Highstreet. Is that really pedestrian-friendly at all? The mall’s main entrance is a roundabout exit off the Mt. Lehman interchange at Highway 1. You can complete avoid going into Abbotsford by shopping at Highstreet! I actually have no problem with large-format retail or even lifestyle centres in general. There are plenty of good examples of both these forms of retail that integrate into communities, and are surrounded or include a mix of housing types. The mixing of housing and retail is what builds actual accessible and pedestrian-friendly communities. Highstreet could have been such a place if the City of Abbotsford allowed higher-density housing around the lifestyle centre, Highstreet had a residential component, and the mall didn’t turn its back to the street. Unfortunately, Highstreet is just a twist on your typical power centre that draw people away from accessible town centres to auto-oriented shopping at the edge of town.